Fragrant shades of pink to lavender/purple; some plants will have white accents on the petal edges or centers, bred from 'Pink Perfection' Strain. Cool summers produce darker colors like the second photo, warm summers lighter shades as shown in the opening photo. Stems from this strain will reach from 3 to 4 feet when established. July Flowering. Quite Fragrant. 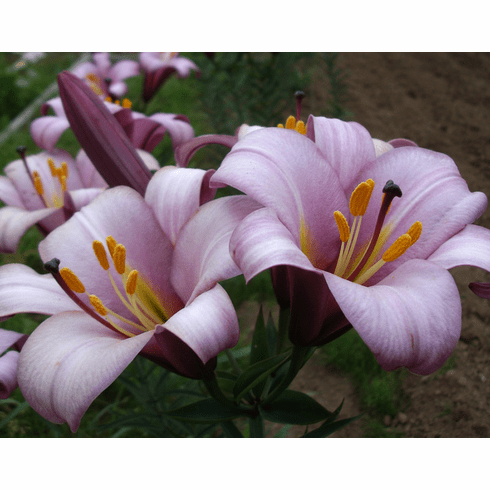 Bulb Size - Our standard for bulbs of this Trumpet Hybrid Lily Bulb cultivar ranges from Premium Size (16/18 cm) to Exhibition-size (over 20 cm).